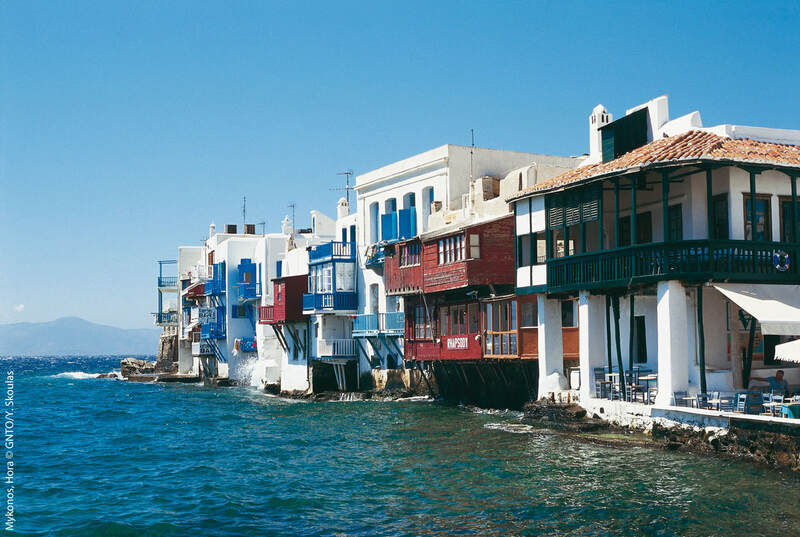 Mykonos was one of the first Greek islands to become an international travel destination. During the late '60s and early '70s, Mykonos was famed as a haunt for the rich. The island's nightlife - then and now - was a glittering whirl of colored lights, music, and parties. Mykonos. Hora. Photo by Y. Skoulas, courtesy of the Greek National Tourism Organization. Mykonos is only 10 miles long. Visitors from other islands find Mykonos to be a lovely change of pace and atmosphere. Its dry, rough topography makes its radiant beaches all the more inviting, and its air is clean and warm. Mykonos has earned the reputation of being a cosmopolitan island that draws an enormous amount of tourists to its sandy beaches and hilly terrain. It is quite a dynamic place, attracting all types of travelers depending on the seasons. During the early summer months, it is a hot spot for party-seeking college students. But during the off-peak months, Mykonos transforms into a haven for sophisticated tourists, artists, and intellectuals seeking to vacation in the midst of beauty. It is also quite popular among Londoners and Parisians, as it is known for its chic style and accessibility. During her life, Jacqueline Kennedy-Onassis frequented the island and helped transform it into a decidedly socialite-heavy place. The same elegance and magic that once attracted Jackie O. remains today in the form of a beautifully cohesive landscape that suggests a reprieve from the harsh contrast of some of the other Cyclades terrain. ​Here you will find sweeping shores, warm air, charming houses and an aura of placidity. The capital of Mykonos is Hora, once a town of fishermen and boaters, where the invitation is to relax and enjoy the slower environment. Here you can spend an entire day reading on the beach. Or, perhaps you will want to window shop at seaside boutiques, stroll along the port, and sample Greek cuisine in any number of Hora's restaurants and specialty stores. You could just set out with no destination at all and wind your way through the town's delightfully narrow streets and explore. You will soon realize that in Hora, aimlessness is an acceptable and commendable form of leisure. Whether you are looking for excitement or calm, you are sure to find it here, as Mykonos also boasts of an energetic social scene. Spend the day relaxing, then dance through the night. There is truly something for everyone here. Greek mythology tells us that Mykonos was formed when Hercules defeated the Giants and flung their bodies into the Aegean, where they petrified and became the voluptuous island that we know today. But there's another side to Mykonos - the neighboring island of Delos. In classical mythology, Delos was the birthplace of Apollo and his twin sister Artemis. Travelers to Delos can stroll among the island's vast ruins, which include three temples consecrated to the Sun God and the famed Lions Walk. 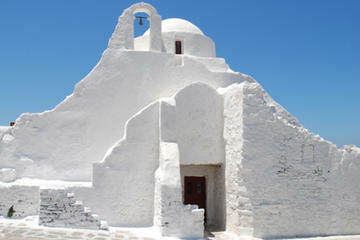 Mykonos town features hip boutiques, restaurants, jewelry stores, souvenirs, tavernas and cafés. The island's famed windmills are found just south of the waterfront. Here the beaches are powder soft and the drinks flow freely, if that's what you're looking for, but there are areas of a more tranquil energy too, in its twisting village alleys and quiet mountain landscapes. The visitor can experience any combination of lifestyles. 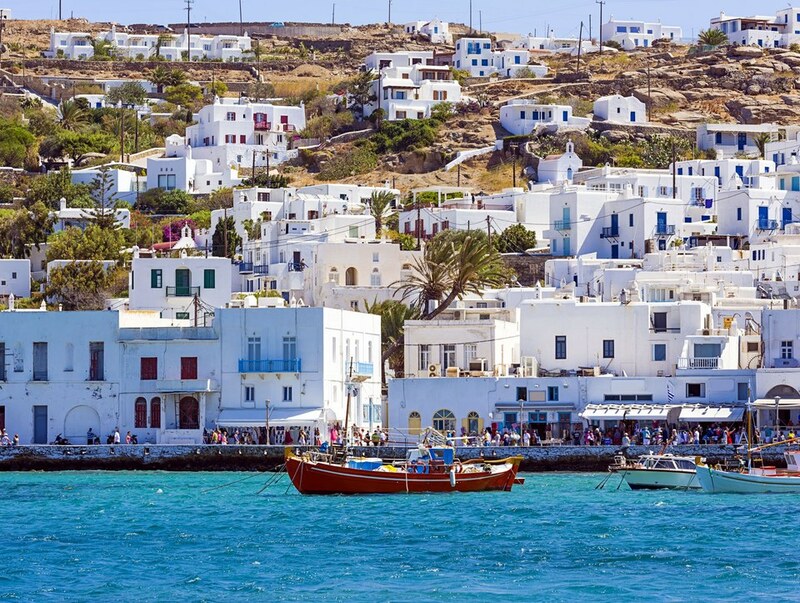 In short, Mykonos has a little something for everyone. For a line of products by Airportag, the best Aviation and Travel Gift Shop, on the Mykonos Airport check here! We have selected, and present to you here, several lines of top quality swimwear by a number of the finest companies from around the globe, for you to chose what suits you the most, to wear when enjoying the numerous glorious Greek beaches. Mykonos. Hora. Little Venice. Photo by Y. Skoulas, courtesy of the Greek National Tourism Organization. Despite its small size, the island of Delos, the birthplace of Artemis and Apollo, is one of the main archaeological sites in Greece. ​These sacred grounds reveal temples and sanctuaries within their marble ruins. Situated under the Byzantine Monastery of St. John, charming, whitewashed houses and blue-domed churches are built into the hillside, and narrow, windy streets reveal shops and tavernas at every turn. A jumble of and blue, the whole place is a warren of narrow lanes and endless nooks and crannies hiding a little church here, a boutique there. It climbs from the port up the gentle inclines of a hillside, watched over by the windmills. Photographed by millions of visitors, these houses are built along the seaside and offer a sweeping view of the Aegean. The island's famous 16th-century windmills occupy the high ground. 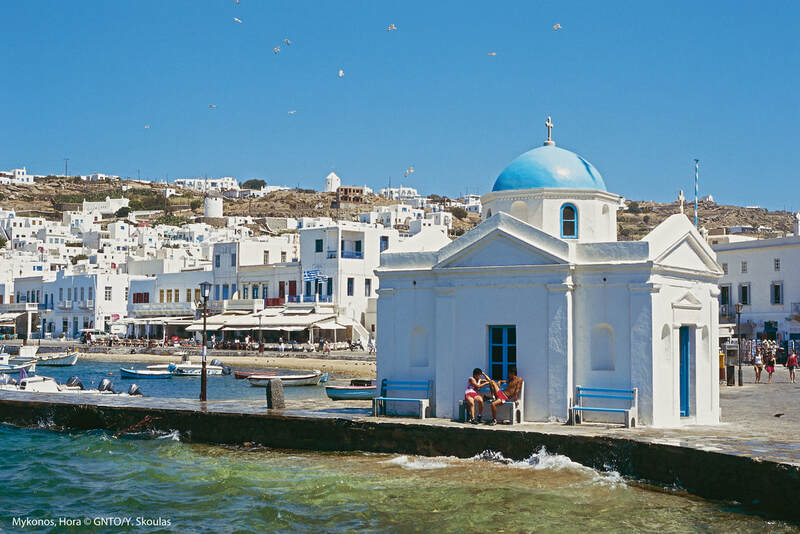 Other than its cosmopolitan status, Mykonos has an authentic side which you will discover by touring the villages, the little fishing ports and magnificent remote beaches with your experienced tour guide.